Page One Power announces an expanded range of SEO services that help clients create comprehensive SEO strategies fully integrated with their marketing and business goals. 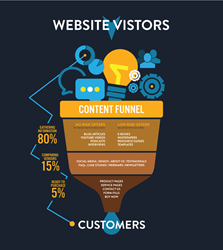 One role of a professional SEO is to analyze channels that make up your business's content funnel to identify where visitors that are most likely to convert are entering your website. These services are offered in addition to the custom link building campaigns and individual link building services that remain the company’s primary focus. Page One Power clients now have access to a wider range of SEO services, exclusive of link building campaigns, creating new opportunities for clients to apply Page One Power’s SEO expertise and insight to their overall SEO strategies. Clients can now leverage Page One Power’s consulting, auditing, and keyword research services to develop complete SEO solutions for their businesses. The company remains focused on providing sustainable, white hat link building services. Service packages are tailored to each client’s unique needs. Services begin with auditing and website performance analysis to discover where website visitors who are most likely to convert are entering client websites. Websites are then optimized to perform better than the competition using a variety of SEO techniques, including content creation, link building, and website revisions. “The most effective link building campaigns are developed as a part of a larger SEO strategy. The solutions we offer our clients are optimized to help them get the most from their SEO investments, and create the foundation needed to support the implementation of their strategy,” explains Project Manager Nick Katseanes. A full listing of the expanded service offerings is available on Page One Power’s SEO services page. The expansion reflects the growing demand for high-quality SEO services, as the value of sustainable SEO practices continues to rise. Page One Power has long been a proponent of sustainable SEO and will now publically offer access to its full range of high-quality, white hat SEO services, beyond the scope of support for link building campaigns. Page One Power is an established innovator in link building and continues to offer pioneering link building services. Contact: (208) 229-7046, info(at)pageonepower(dot)com, or http://www.pageonepower.com.